Kati is an uber-talented, funny, creative dynamo who is going to make it big in theatrical costuming and the crafting world. We first met when she became the assistant to the Hair and Makeup Department at Seattle Opera, and proved to be a huge asset there. Since then, we’ve worked together on several shows at Pacific Northwest Ballet where I found out she’s a terrific costume technician, and I learned several construction/sewing tips from her. Kati recently launched her business, “Bagatelle” – a cool line of purses, totes and other fabric items – and has a growing number of loyal customers and fans for her beautiful work. This summer, she is going to be an assistant wardrobe manager at the Santa Fe Opera*. If you don’t know about the Santa Fe Opera, it is one of the top opera venues in the world, with the biggest opera superstars performing there and patrons fly in from all parts of the globe to spend the summer in Santa Fe and watch performances under the stars at this beautiful outdoor space. This is a really big deal and I’m so proud of her for landing this gig. So check out Kati’s interview with me on her blog, and make sure to look at the great crafting ideas she has. I’m working on her “Fabric Flowers” pattern to make some for gifts and package trims. Her instructions are really easy to follow, she has good pictures showing you the steps to take, and the end result is a fool-proof item for yourself or as a swell gift. Bring out your thread! 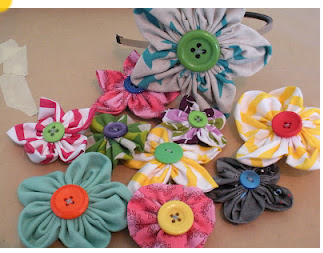 Kati's sweet Fabric Flowers - easy-to-make and they never need watering! *Two favorite singers I’ve worked with, the awesome tenor, Bill Burden (who owns two of my sock monkeys), and superstar baritone Mariusz Kwiecien, will be performing King Roger there together this season.